Saw this billboard on the way to work today. LOVE IT!!! I’m still like a little kid when I see an ambulance or fire truck. It inspired me to Google “texting while driving,” (while in a house,not my car) and whoah. There’s so much that applies to all kinds of distracted driving. Let’s start with the FCC’s website on Texting While Driving. And an article in June 2009’s edition of Car & Driver magazine that includes a description of a simulated road test with a texting driver. Here is a 2009 segment on The Today Show that is fascinating! Here’s the original British PSA. Warning: It is graphic! While this might seem like an extreme video, these situations are REAL, deadly, and on the rise with the popularity of technology. PLEASE share this video with one person! The portrayal of the vehicle damage, patient response, and EMS procedure is impressively accurate. Patients in a crash will either be in shock, or very emotional, like the teenage girl seen here. Teenagers do tend to revert to childlike behavior. How can YOU reduce your distractions while driving? Don’t use your phone in the car (talking or texting or checking email), put on makeup, or to discipline your children while the car is moving. Don’t read that report for work, and stop trying to be a DJ with your iPod or CDs. If you need to do these things, pull over to a safe place. It might seem boring, and you might think that YOU are highly skilled at multi-tasking, but remember: it’s not just your life you’re endangering. What was your reaction to the PSA? 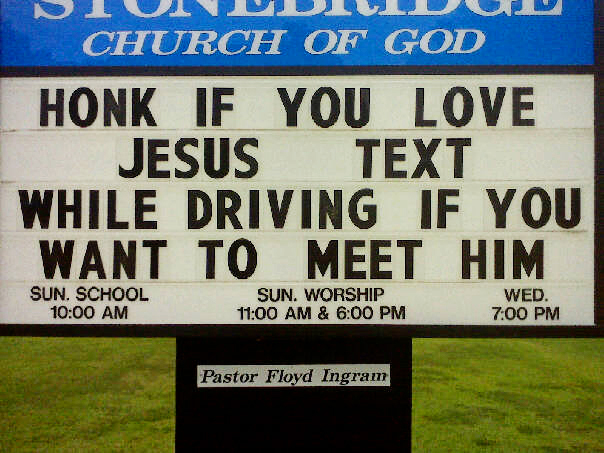 Do you text and drive? You read the article about the truck driver who crashed while texting on one phone and talking on another? Absolutely ridiculous. People are so stupid, you can no more text & drive safely than you could read a damned book while driving. 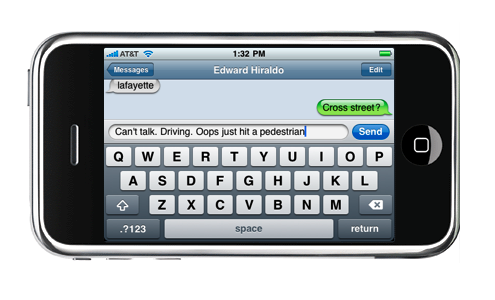 Text while driving causes as many accidents (per group, size of group, etc etc) as drunk driving. I stopped driving a few years ago, now I live in Sweden and everybody rides a bicycle, there are special paths so you don’t have to get hit by a car. When I DID drive, if the traffic was particularly heavy or fast or I felt like I needed to focus, I would turn off the radio – and if people were in my car I would ask them to be quiet. Even TALKING to a person in your car is distracting enough to cause a wreck. Distracted driving is a huge national problem and hopefully these campaigns will get the message across. Previous Previous post: Shameless Plug Sunday! Next Next post: Hellooooo Philly!